Almost 80 years after Leon Trotsky founded the Fourth International, there are now Trotskyist organizations in 57 countries, including most of Western Europe and Latin America. Yet no Trotskyist group has ever led a revolution or built an enduring mass, political party. 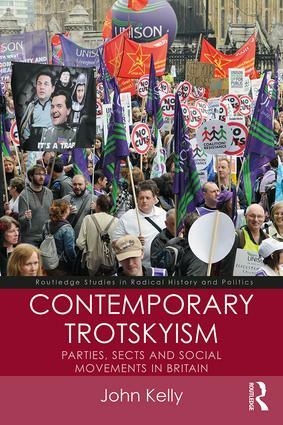 Contemporary Trotskyism looks in detail at the influence, resilience and weaknesses of the British Trotskyist movement, from the 1970s to the present day. The book argues that to understand and explain the development, resilience and influence of Trotskyist groups, we need to analyse them as bodies that comprise elements of three types of organization: the political party, the sect and the social movement. It is the properties of these three facets of organization and the interplay between them that gives rise to the most characteristic features of the Trotskyist movement: frenetic activity, rampant divisions, inter-organizational hostility, authoritarian and charismatic leadership, high membership turnover and ideological rigidity. Trotskyist groups have been involved in a wide range of important social movements including trade unions, student unions, anti-war, anti-racist and anti-fascist groups. While their energy and activity in civil society have had some success, their influence has never been reflected in votes or seats at elections even after the financial crisis. Drawing on extensive archival research, as well as interviews with many of the leading protagonists and activists within the Trotskyist milieu, this is essential reading for students, activists and researchers with an interest in the far left, social movements and contemporary British political history.